Sunita Shrestha wakes up at 6.30 AM, helps to prepare food and tea, washes the dishes and learns how to make Dal bhat, a traditional meal in Nepal. At 8.30 she changes into her school uniform. School begins at 10 AM and ends at 4 PM. She then changes into working clothes again, does her homework and chores around the house, like feeding goats and chickens. Sunita lives in Nalang 5 Dhading, a small rural agricultural village. She is 13 years old. Her parents are farmers from the third caste, Baishya. She has three older brothers and two older sisters, who have already left the family. Since she was the youngest and the only girl left in the house, her parents wanted her to stay and work in the fields and not attend school. 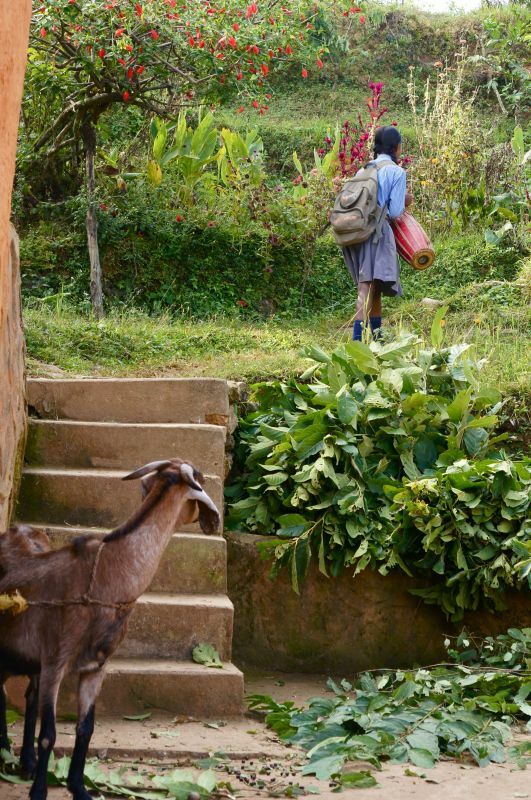 However, Sunita is a curious girl, who longed to obtain an education. Her parents are close to the Regmi family, of the highest Brahman caste. The family consists of three sons and no girls. The Regmi father suggested that Sunita should stay at their place, a few kilometers away. She was asked to do some chores around the house and they would provide her food and lodging, pay the tuition fee to attend school and provide her the time needed to do her homework. So that is what happened. Although Sunita sees her parents weekly when they work on the rice fields, Sunita only stays at her parents place during festivities. One could consider this as an act of humanity of the Regmi family, but Sunita's future is still insecure. She is more than welcome to stay at the Regmi place as long as her education lasts. But even though she wants to finish school, her parents would like her back home again permanently, quit school and work at the farm. If they insist, Sunita will have to go back to her parents and the variety of future options that a finished education would offer her would be reduced to just one: to have a future as the wife of a farmer.